Chances are if you have a young boy in your life, he likes superheroes, rocks, and throwing balls. He rides his bike with abandon, catches bugs by the dozens, and roars war cries while waving sticks in the air ready for imaginary battle. Most of his pants have holes in the knees, and he sports a Band-Aid on a scraped limb more often than he does not. Indoors he is wild and rowdy and has a difficult time sitting still and keeping his hands to himself. He likes to wrestle with his friends — especially at school during rest time or story hour. He is a whirlwind of broken toys and knocked over glasses of milk. He’d rather dig in the dirt for treasure than color with a crayon and has been known to hide under a table when glue and colored paper are presented to him. As parents, we are tasked with raising intelligent, responsible, creative, “rightly constructed” children. If we live our lives in an artful, imaginative way, then we want our children to learn how to live creatively as well. But if the little boys in your life run from art and would rather play on the playground than paint with primary colors, then how do we expose our children to the joy of creating art? When discussing children, it is nearly impossible to speak in generalities that will pertain to every child. You may have little boys in your life who love to sit and draw, paint and create, and I’ve known many of these delightful boys over the years. But I find great joy in the scrambling bursts of energy and emotion that wild boys bring to my life and to the art room. Finding an art project that engages the heart and mind of a child, and especially a little boy, is like glimpsing a perfect moment of how God intended for us to live. There is a time and place in a child’s life for learning the “rules” of art and the techniques to be even more successful at art. That can happen later when the child is older and developmentally ready and eager for more instruction. While they’re young and bursting with energy, why not nurture the simple “rightly constructed” joy of using the imagination and creating? When choosing art for boys and for all children, I have learned to seek out the projects that include one or all of the following aspects while maintaining the integrity of the child’s creative spirit. Boys (and girls, too, for that matter) flock to create art where there appears to be a creative mystery or a creative process that is awe-inspiring. The best projects for young children are the ones that invite experimentation and play and urge children to ask, “What if?” Like “What if I add this?” or “What if I mix this?” or “What if I move this?” Projects that surprise the child with unexpected materials or an unexpected process will evoke wonder time and again as they repeat the experience and try to make sense of it. Consider how you define art. If you broaden your definition to include the creative process as well as the product, you will learn that the process is what brings wonder to your children. Once, I taped bubble wrap to the back of a preschooler’s shirt and his friends painted the bubble wrap and then the preschooler backed into the paper-covered wall to make a print. Everyone gathered for that project and the boys marveled at the colors and pattern the bubble wrap made and experimented with the motion of backing into the paper. Every art-resistant boy painted that day. Boys who like to dig in the dirt often love to plant seeds in a garden, and when the garden starts to bloom and grow, they are delighted to participate in the process of gardening. One of my favorite “wonder” projects is to plant fast-growing grass seed and days later, when the grass has grown, to hand the boys scissors and let them cut and sculpt the grass. Tell them the grass needs a haircut, and the boys will laugh and cut away — strengthening their fine motor skills in their hands as they practice cutting with scissors. My own sons took this idea a step further: when little, they would grab their little safety scissors and come help me with yard work, helping me trim bushes and grass and noticing the shapes and patterns they created. I have found that the same boys who reject experimenting with art supplies will flock to a science experiment. Science and art are related in that both require experimentation and play, observation skills, critical thinking, and creativity. Science Arts by MaryAnn Kohl and Jean Potter is a resource I use over and over again to surprise boys with the wonder of the scientific process of creating art. Spray paint rocks with gold paint and hide them in a sandbox or in a spot in your yard where your child can dig in the dirt. Hide pennies in the sand box. Fill a bucket with water and let the children “paint” water with brushes and sponges on the sidewalk, porch, or deck. Fill a tub with water and let your child experiment with items they find around the house to see if they float or sink. See if the child thinks of using the items to build a boat. Fill tubs, bowls, and cups with water and place them in the freezer until frozen. Remove the block of ice from its container and place it in a larger tub. Let your child sprinkle salt and drip watercolor or food coloring on the ice. Projects that require a little risk are particularly appealing to young boys. The boys who jump from heights greater than you’re comfortable with, climb up trees further than they should, or dash through your home around sharp corners with little caution require art that appeals to their sense of daring and bravado. Yet art does not have to require dangerous tools or physical danger to be risky. Isn’t it simply a risk to try something new? For boys, art should invite exploration and manipulation of supplies. Artists know that the artistic process requires great courage, and they know that sometimes their efforts result in failure. Boys need the freedom to try something new and have it not turn out the way they imagined it would, and then they need the freedom to try it again. Risking failure leads to innovation and growth in creativity. Boys who look at a paintbrush with disdain will be curious to try painting with two paintbrushes taped together end to end. Try painting blindfolded or paint while looking in a mirror to really appeal to the risk-seeking boy. Bind several crayons together with a rubber band, and invite your child to try drawing with them. 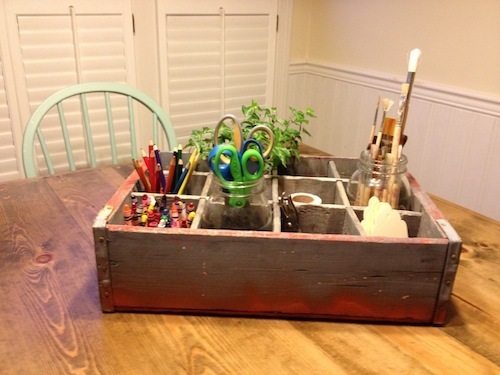 Few things will appeal to a boy’s desire to explore more than painting with items that are not considered paintbrushes. Try dipping dog toys in paint and pressing them to paper to see what print they will leave. Make prints with toy cars, toothbrushes, forks, and spatulas. Roll marbles in paint on paper to see what type of tracks they make. Author and early childhood education expert Bev Bos has one of the best resources I’ve found on innovative art ideas for children and especially boys, in her many books. Don’t Move the Muffin Tins is one of my favorites. If you still find resistance to trying a project, take the art outside, where rowdy boys aren’t confined and feel more at home. I have found that if art supplies are outside on a back patio, on a picnic table, or simply in the grass, boys are more likely to be curious about creating art. I have a collection of plastic child’s hard hats that some clever parent years ago attached a paintbrush to for children to wear and paint with their heads. When boys see these hats for the first time, their eyes widen and light up and they’re eager to try it. I’m just as excited as they are when I see them experiencing paint in a new sensory way. And I’m just as happy to see the children who choose to stand back and observe. Children learn in multi-sensory ways and observation can be just as powerful as the experience of taking a risk to create. Forcing a child to participate in art results in squashing that child’s imagination and confidence in his God-given creativity. Gentle nudges or patient invitations to create are much more effective, and if you have chosen a project well, the hesitant child will try something because he feels he is safe to take a risk. Take all art projects outside. Paint with a mop, broom, or feather duster. Press a flyswatter in a shallow tray of paint and splat it on paper. With a spray bottle, spray water on a piece of paper and draw with dry chalk. Fill a spray bottle with liquid watercolor. Spray paper with it. Spray shaving cream or whipped cream onto a cookie sheet. Let your child draw designs into the cream with their fingers, a comb, craft stick, or toothbrush. Some boys are resistant to art because they long for a sense of power and control, and somehow, along their way, art has been presented to them as something they must do with no opportunity for control over their project. Carefully choose art that will fill that yearning for power of choice while nurturing their imagination and problem-solving skills. One of the simplest ways to give a child a sense of power and control is to simply ask them, “What would you like to do?” Honor their request for different colors of paint, paper, and supplies. Ask for input from the children, and especially from the boys who tend to reject art to see where their creative interests lie. “What would you like to paint with?” a wise teacher asked the preschool boys in her class, and one of the boys giggled and said a fish. The other boys laughed, too. The teacher went to the market that afternoon, and much to the amazement of the children, brought a whole fish to school the next day. The boys couldn’t wait to paint the fish and press paper to its body to see the print its scales made. Few projects meet the need for empowerment more than building sculptures. Widen your definition of sculpture beyond plaster or wire to include anything three-dimensional. Wooden blocks of all sizes can be turned into sculpture as children play with them. Artist Andy Goldsworthy has made sculpting with items found in nature a highlight of his career. Let children build and stack and construct with what they find naturally in their backyards. Think about what else your child imaginatively builds that gives them power over their own creativity, critical-thinking skills, and problem-solving. One summer at an art camp I held, a group of boys decorated cakes with fondant pastry bags and decorating tips. We took pictures of their masterpieces, and they proudly carried their artwork home. The woman who mentored me when I first became a teacher now works with middle school-age boys, and she recently mixed a batch of chocolate modeling clay for the boys to sculpt with — meeting the boys’ need for both wonder and power with one project. One night last spring I held an art party for thirty children, and one of the projects I had for them was building sculptures by sticking toothpicks into packing peanuts (marshmallows or beans work as well). The children made houses, structures, animals, and abstracts, and one middle school-age boy made a giant man. Months later, when I see the kids, they still tell me it was their favorite project of the night. It was the perfect project for experiencing wonder, risk, and control. What gives boys and all children more power than tossing some old sheets over a couple of chairs to create a fort? Boys love to create their own spaces and feel power over their space. Large cardboard boxes serve the same purpose as well. A preschool my children attended turned the space under a desk meant for a chair into a tiny space perfect for a child. A child was usually spotted curled up in the spot watching the activity around him. Boys who are always moving, running, and bumping into things, throwing and taking up space need to create art that way as well! Match their activity level. Let them stand to create. Find projects that require motion or strength or manipulation of supplies. Roll marbles in paint, throw tennis balls dipped in paint at paper, swing on your stomach while holding a paintbrush and paint paper that is underneath the swing. Tape paper under a table and let your child lie down under the table to paint or draw, like Michelangelo painted the Sistine Chapel. One of my own sons, when he was little, would not take the time to draw or color until I moved the crayons and paper from the cupboard to the kitchen table where it was visible every day, and it remains there years later. Now he is school age and will draw and write every day as he gets a burst of creative energy and sees the creative tools he needs ready and waiting for him. I added scissors and tape, glue, string, a hole punch and a stapler, and now the table is often piled with little projects he has made and is continuing to work on. Children who visit my home gravitate to the “art table” as well and are welcomed by a visible invitation to choose what they create. Pour cornstarch into a plastic tub. With a spray bottle, spray colored water on the cornstarch. Play with combs and craft sticks in the cornstarch as the child mixes the color into the powder. Play with flour in plastic tubs with measuring cups, funnels, and spoons. Mix water into the flour. Let your child cut apart your recycling cardboard boxes and paper towel tubes. Provide your child with tape and string and see what they can create. Scoop a small amount of paint on to the middle of a piece of paper. Fold the paper in half and gently press down on the paper. Open the paper to see the pattern you made. Accept that while you may know a way to make a child’s product look better, children gain more from exploring the creative process themselves. Unless asked to help, let boys have control over their exploration as they risk failure and experience the wonder and awe of discovering they’re ready to go somewhere and dig for treasure. Krista Barré lives in Franklin, Tennessee, and has been married to her husband, Nick, for 17 years. They are raising their three sons to be wonderers, risk-takers, and to see possibilities in the impossible. Krista currently works with the Arts Council of Williamson County teaching art classes for preschoolers in some of Franklin's historic locations. A wife and mother, Krista Barré places a high value on being a wonderer, a risk-taker, and a good listener. When she isn't tending to her family in Franklin, Tennessee, she enjoys reading a good book, spending time with a friend, and hearing the stories that have made people who they are today.